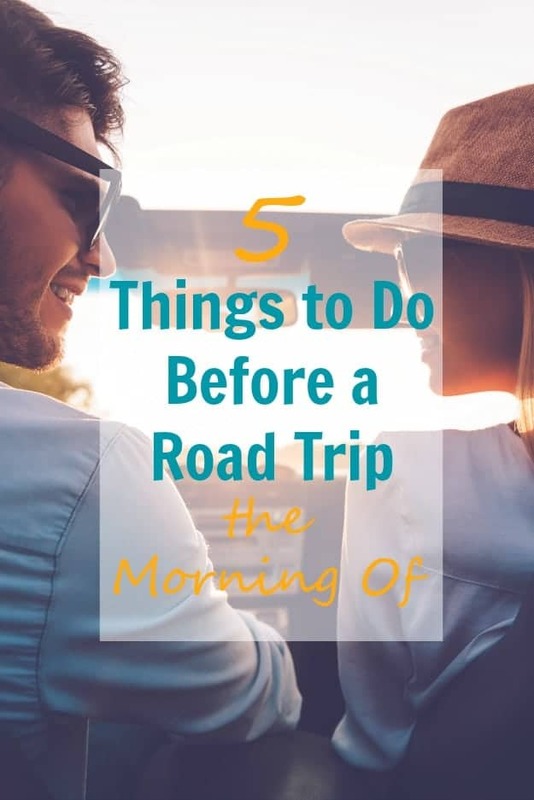 5 Things to Do Before a Road Trip the Morning Of – I am sharing some of my top 5 tips you should do the before morning of before your next road trip! Packing tips and essentials every traveler should have! If there’s something, we both love it’s taking a long or even a short road trip somewhere. Road trips have always been one my favorite things to do. I remember always jumping into the car whenever my mother was going somewhere, even to the grocery store, or even taking a trip to see family that’s 3-4 hours away. I’m not so sure how fond I am about going to the grocery store now. It’s one of those necessary things as an adult, not enjoying the least. At least the area I’m in because it’s always so busy and chaotic. I may enjoy it a little more if I have the store all to myself; hey, a girl can dream, right? As we are about to take another road trip this weekend to Charlotte, NC, which is about 5 hours of a road trip. Not too long, just right! I thought it would be a great time to share with you some of my things I do before heading out the door on my road trips. If you haven’t already, make a list of the things mentioned below. I always love checking things off a list, and it helps me to remember everything single thing. Or so I say. I am a huge coffee fan and cannot function without it. I start my daydreaming about coffee. Seriously. It’s one of the first things I make sure I have. Sometimes in the morning, I do not have enough time in the morning to brew a couple of cups of coffee, so I thought getting my coffee overnight would be amazing. It sure was! It came piping hot even though it was sitting on my front porch for 12 hours or so. They claim it says warm or cold for up to 24 hours, and I think it will. My overnight coffee came in a 40-ounce vacuum insulated thermos. 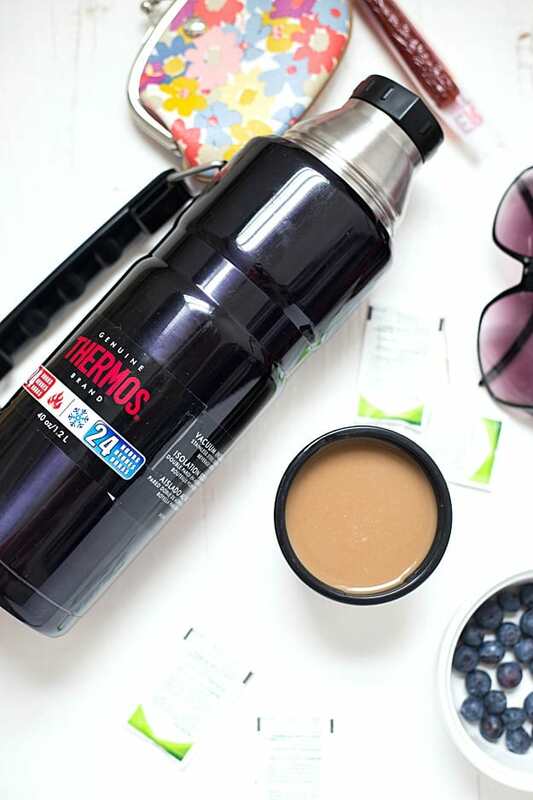 The best part about the thermos is you can touch it without burning your hands! Some of the snacks I like to carry in my purse is fresh fruit, water, and beef jerky or something similar. It’s one of my husband’s favorite snacks. 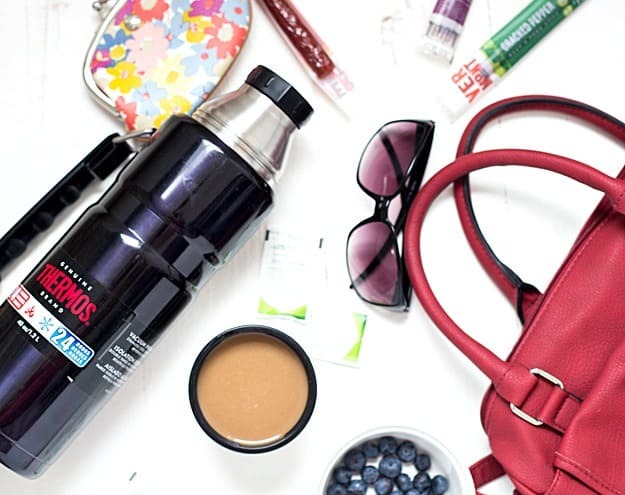 The best part about the thermos is you can touch it without burning your hands! Some of the snacks I like to carry in my purse is fresh fruit, water, and beef jerky or something similar. It’s one of my husband’s favorite snacks. So what I do mean by having a game plan? A game plan to me means having your itinerary of the places you are going all laid out. I like to group similar activities together that are close to each other and having them labeled on a map. My sense of direction isn’t the greatest and having it labeled helps me tremendously. A couple of other things I like to have planned out before we head out the door is where we can stop for gas, lunch, or even stretch and walk around. When we are traveling, I like to pack light and smart by only packing the necessities. Even for a road trip, I like to pack like I would a carry-on for a flight. Even though I would love to have ten pairs of jeans, realistically it’s not necessary for a 5-day trip. Also, remember to pack like items together and make sure you can access any important things quickly. Life gets crazy and so does your car sometimes. I know mine at least does. Usually the night before the trip, I put on music on my phone and get to town cleaning and throwing out trash from the car. Sometimes it only takes a few minutes. The week before we are scheduled to leave for our road trip, I like to make sure the car maintenance is performed if it needs it soon. Breaking down on the side of the road isn’t fun when you are road tripping. Even a flat tire is annoying, so remember to have a spare with you at all times. The week before we are scheduled to leave for our road trip, I like to make sure the car maintenance is performed if it needs it soon. Breaking down on the side of the road isn’t fun when you are road tripping. Even a flat tire is annoying, so remember to have a spare with you at all times. We use our phones so many things, including for our GPS. I like to make sure I have any necessary chargers and car chargers in my purse before heading out. It’s a bummer to run out of battery when you are looking up directions. Hasn’t happened to me before, but it’s one of the things I do not want to experience. So here are my top 5 things to do before a road trip the morning of! What are some of your things you must do? Right now Thermos is running a giveaway on their Facebook page for your overnight coffee shipment right to your door. Contest runs May 19, 2016, until May 23, 2016!